I received the box. Not only do those two films not include English subs, but from what I can discern (blu ray menu and hitting the subtitle button on my remote), there are no subs of any kind on any of the films/discs. Can anyone owning the 2016 Essential Collection set indicate how the subs for that set are accessed? Are they on the disc menu options? Question re: the transfers. I'm gathering Contempt and Pierrot le Fou are the same ones used as on the 2010 releases? Really enjoyed Demons of the Mind, which I regard as perhaps the finest Hammer film, a beautiful and shocking tale of repression and superstition, elliptical, free form and poetic in execution. Very strong Blu ray, as far as I can see no digital errors, with subtle colours, natural grain and fine detail in both bright and dark areas. The rumour says that it's so bad, Lionsgate delayed their release in order to get hold of possibly an unfiltered master. It will still leave us with the awful new color timing, but at least, if we can get rid of this god-awful DNR and EE, that'd be a good start. It's a shame because the uptick in details is vastly visible, but it's textureless as hell. It is apparently derived from the 3D master which was degrained because apparently grain and 3D dont necessarily play that well together. Hopefully the pre-3D master is still available. nitin wrote: It is apparently derived from the 3D master which was degrained because apparently grain and 3D dont necessarily play that well together. It is the most surprising part to me, considering how many older movies have been converted to 3D / restored in their 3D-version without having such a heavily filtered aspect. It's even more surprising that you can find such an example within Cameron's own filmography with Titanic, whose BD 3D-release doesn't exhibit such waxiness at all (and looks instead very lovely, just like its 2D counter-part). I tend to think that this new T2 restoration simply is screwed up because whatever the reason, 3D or not, somebody at SC thought it would look better with the DNR set up at 11 and compensated by some EE. I'm quite sure SC have different teams working on different projects, and this clearly isn't the team working on their Vintage Classics UK brand, but rather the one that screwed up Purple Noon and thought the Bergman restorations would be better off DNRed. James Cameron himself is very keen indeed on degraining, and I suspect he'd have contractually-mandated approval. But I've also heard from a friend in the business that the 4K disc is a disaster - he honestly thought he'd been sent the wrong thing at first. James Cameron is keen on degraining, but the results so far never looked so poor (far from it), and in the case of Aliens, it was technically reasoned. In the present case, it just looks like the UHE release of Predator, and I don't believe the 3D reasoning behind could ever justify so strongly filtering the movie. MichaelB wrote: he honestly thought he'd been sent the wrong thing at first. It's sadly not surprising that some would have reacted this way. The French releases are completely English-friendly (including the supplements). Will UK releases be the same, apart from packaging? No reason to assume otherwise: the mere fact that the French discs are completely English-friendly suggests that one master was created for at least two territories (as is common practice for StudioCanal). If you don't mind French on the outer packaging there's no reason to wait till March and with these being Studio Canal, they won't be signficantly cheaper than the French discs for a good while yet. Plus, the stylish slim cases of the French discs do save space on the shelves. Finch wrote: If you don't mind French on the outer packaging there's no reason to wait till March and with these being Studio Canal, they won't be signficantly cheaper than the French discs for a good while yet. Plus, the stylish slim cases of the French discs do save space on the shelves. Thank you, Finch and MichaelB, for your replies. The UK disc start with the option French / English, so they are identical. The transfer of La prisoner is gorgeous, both the picture and the sound. Watched it projected, simply unbelievable wonderful. The film is interesting (a little dated). Couldn't stop thinking in the first 30 min, that i'm watching Tati's Playtime, and the rest is a mix of Peeping Tom and Belle de Jour. If only Henri-Georges Clouzot knew that 50 years later everyone has a camera in their pocket, and every child can google those kind of picture's in a second. This indeed is getting an impressive release. Five discs! And in its originally intended widescreen aspect ratio for the first time ever, albeit only as an extra exclusive to the expensive multi disc LE set. Rivette’s THE NUN (1966) is up for pre-order at Amazon UK. Assuming Amazon will honour all pre-July orders from Australia now is the time to order this brothers and sisters. 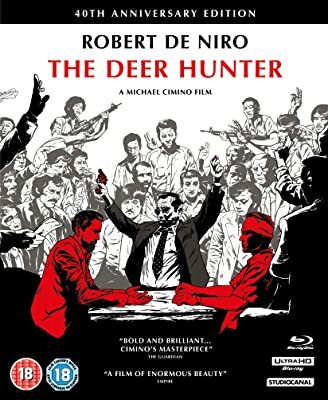 Renoir's The Crimes of Monsieur Lange is also up for pre-order, as are some 40th anniversary editions of Deer Hunter. According to Blu-ray.com, this batch of Studio Canal releases also include Bagdad Cafe, Last Year at Marienbad, The Seventh Seal, all newly restored in 4K. The Deer Hunter Limited Edition will include a UHD of the film. Missing is the Vietnam War: Unknown Images documentary included on the Studio Canal older release and the trailer.